7 Ways To Celebrate World Photography Day! 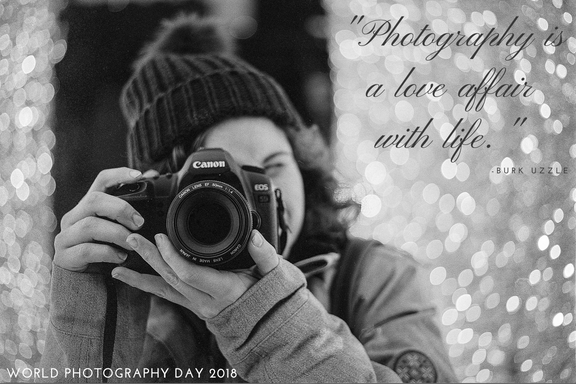 It seems that there is no shortage of obscure holidays these days, but there is one you may not know about that is near and dear to my heart - World Photography Day! With it's official designation in 2010, World Photography Day was originated with the purpose of inspiring a better world through photography, whether it be in your community, or right in your own home. Here are just a few ways you can celebrate the art of photography this Sunday. Take a Family Portrait - Most cameras have a self-timer feature, and this is the perfect time to use it! If the thought of getting everyone to sit still and smile stresses you out, then go for a candid moment - maybe reading together, cooking dinner, or enjoying some time outside. Pro Tip: Don't have a tripod? You can use a stack of books placed on top of some furniture, just adjust the number of books to achieve your desired height. Take a Self Portrait - And I don't mean a selfie. Break out that self timer feature again and capture yourself doing something just for you, like enjoying your morning cup of coffee. Hour by Hour Project - This is one of my favorite photo projects. From the time you wake up, until you go to bed, take one photo, every hour, on the hour. It's an easy, stress-free way to capture a day in your life. Street Photography in Your Community - What's going on in your town on a Sunday afternoon? Take a walk around, or stop by your favorite local place, and document what you see. I love looking back on photos like this many years later to see how much has changed! Order Some Prints - Or canvas. Or frames. Or an album. However you choose to display your photos, this is a great day to get the ball rolling on making that happen. Our photos are meant to be seen! Break Out The Crayons - Because, honestly, who doesn't love coloring? Here are some free printables I put together for you, just click and print! If you try any of these ideas, please come back and let me know in the comments! I'd love to hear how you celebrated this obscure but important holiday. Have a fantastic weekend!